They're not bad, and kinda fun to see after all these years, even if they don't do justice to Don's take on his own character. Though he's not drawing comics on a regular basis, he has a couple things in the works, so keep an eye out. I'll update here. For the entry this week, I've chosen two panels from Mask of the Red Fox (House of Mystery #187, DC Comics, 1970). I love especially the first of the two, the composition asymmetrical and off balance, showing us those black & white birches in the foreground from where the fox emerged. This panel is colored well, with just a tiny bit of warm an cool colors on the trees so the contrast isn't too extreme and they don't draw too much attention. The simple outline of the leaning fox gives the frame motion, and the spot of orange surrounded by yellow and green pops the fox, the center of interest. In panel two, the red fox is in the foreground this time, and in silhouette, coming out of the tall grass. I darkened the castle slightly with a violet to help it pop (it was colored a blue not dissimilar from the sky). These are just a couple nice panels from a boldly rendered story, which you can read with Toth's annotations at the link above, as usual at the wonderful Toth Fans site. Unfortunately, it looks like the image links for pages 4 & 5 are broken, which contain the panels featured here. Just for grins, I tried my best to blow out the color from these two frames, just to get an idea of Toth's black & white original art. My pal, Mark Flora, for whom I've done album illustrations, and who played guitar and more for the most recent Bedbugs trailer, has assembled a new band, The Holy Rocka Rollaz! Over this past weekend, the band was out and about at a local car show, spreading the word and passing out CD samplers, which featured my art on the cover, in total Ratfink/Dragster mode. The band provided me tons of good photo reference for the vibe and likenesses. There's still some tweaking and finessing I'll do on the art, as well as the type treatment, but this was good to go for their purposes early on as Mark and his gang lay the groundwork to set up gigs. The Holy Rocka Rollaz are a band that loves and pays tribute to early American rock 'n' roll, probably playing car shows, gigs events and even weddings by the Fall. For your curiosity, I'm including here my initial and only sketch/pencil, done digitally, directly on the screen/computer. I printed it in blue and inked with a brush, scanning and coloring in Photoshop. I'll post updates about the band here at the blog, as well as the updated art when it's completed. In 1957, Toth drew an adaptation of the movie western, Gun Glory, featuring Stewart Granger and Rhonda Fleming. It appeared in Dell Comics' self titled one-shot ("Four Color" #846). Toth did many movie and TV adaptations during the late '50s and early '60s, including Zorro, Roy Rogers, The Time Machine, Sea Hunt, 77 Sunset Strip, No Time For Sergeants and The FBI Story, among many others (some of which I'll cover in future installments). Toth was a master of spotting blacks, well known and emulated for his shadow work and use of silhouettes, and this page from Gun Glory is a prime example. He doesn't do it as a time saver, or 'cause he was lazy, or on every page or panel, but when it suited his purposes in creating a mood and telling the story. This scene takes place out in the open American West, with the sun high in the sky, so the light colors and stark shadows are appropriate. He sets the scene with the rifleman leaving his horse atop a ridge, skipping down for position. Panel two is the true establishment frame, a brilliant bird's eye shot that gives us his location in relation to the rider below. 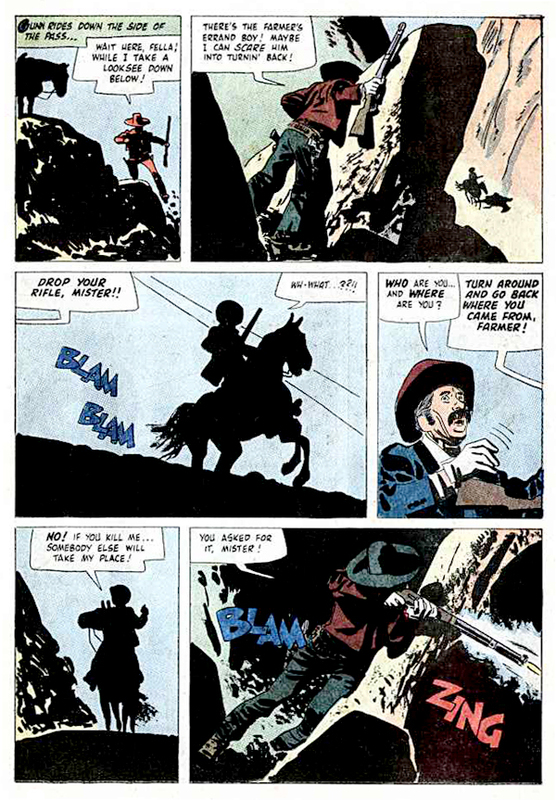 In panel three, though entirely in silhouette, Toth indicates everything the reader needs to know with the gesture of the buck of the horse and turn of the rider as warning shots are fired, all while striking strong angles through the middle of the frame and page. A close up follows to show us the character, jittery, then it's back to another silhouette as the rider regains his defiance and bravado, continuing on. In the last panel, Toth leaves us anxious to turn the page and find out how this conflict is resolved. Each frame works on its own, and the page composition is superb, all angles and triangles, positive and negative shapes, with cowboy's guns blazing along craggy rock. But my favorite panels are the second and sixth: both simple and clear, yet strong and complex. I'm unsure whether these are particularly great scans, or if Dell's printer was extremely attentive in laying down a heavy black ink during printing. Toth seems to have drawn this story and others from the period so they'd carry and look good regardless of how well they were colored or printed. In this case, the coloring is kept simple, naturalistic and subdued, which supports well enough the art and story. 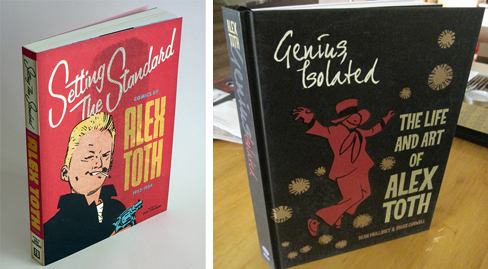 I grabbed the art for the entire story from the Toth Fans web site. To read Gun Glory in its entirety, email me directly a request to paul@bluemoonstudios.com, and I'll send you all the pages in a zipped folder. My longtime friend, editor and collaborator, Brian Augustyn asked me to draw up a little portrait for him, and it was fun to do. He intends to use it as a profile pic option for his Facebook page, and perhaps to spur other artists to contribute one of their own. Not only could you respect his acting talent, but I enjoyed observing his evolution over the years. From James Dean pal and a young Hollywood pretty boy being groomed by the studios; to hippy and drug-crazed rebel, independent upstart and entrepreneur; and finally to cleaning up his act, still a political rebel in his old age, but then by going against the grain of the rest of his baby-boomer peers, turning more conservative. What a life he led. You never knew where he was going to stand, but what a character! And it looks as if he fought cancer towards the end with a smile on his face. Here's to ya', Mr. Hopper. This topic was kicked off by NPR, then picked up by blogger Ann Althouse. Everyone's gonna have their own take on it, depending on personal musical tastes and preferences, and whether a great track can lead off an otherwise mediocre album. The Beatles' Revolver is pretty much my favorite album, and Taxman is a great opening track, but it didn't make the cut for my top twelve, as I'm looking for more: a particular superb track that sets the tone and theme for an album, or perhaps kicks off a great career for an artist or band. So here are my faves, some well known, some far less so. Wouldn't It Be Nice - Beach Boys - Pet Sounds The wonderful tune to open a classic album, the opening song perfectly encapsulating Brian Wilson's naive, innocent and optimistic state of mind in his mid-twenties. The album explores the themes and ideas most important to Wilson at the time: how to find his place in the world; break out on his own; personally and creatively. He's a musical prodigy, yet has been stunted emotionally, damaged by his father, his growth delayed. The album becomes bittersweet as it closes, and more mature, as one can sense his entry into adulthood. And there's no going back. In hindsight, Wouldn't It Be Nice becomes bittersweet itself, because of the loss of innocence (also lamented in J.D. Salinger's novel, Catcher in the Rye), and it just about breaks your heart hearing it and knowing how life went for him not long after. Hello There - Cheap Trick - In Color I find this to be a classic rock tune, a superb opener for an album, show, playlist or party. Sure, they had released an album previous to this, and Surrender was on the following album, but to me, Cheap Trick announced themselves as major players with this song and this album. I love that they kept it so short; it's an intro, really. I love the double guitar lead that finishes it. Bridge Over Troubled Water - Simon & Garfunkel - Bridge Over Troubled Water To open their final album, the folkster duo gives us a hymn (released about the same time as McCartney's Let It Be) that soars. Like The Beatles last, Abbey Road, which opens with Here Comes the Sun, the second side starts with their last and ultimate folk song, a story of survival and persistence, The Boxer. What begins as a simple folk tune with guitar and voice, it builds with additional and effective instrumentation to become a bombastic epic, and one can really feel the triumph of the narrator. We Will Rock You/(We Are the Champions) - Queen - News of the World It's tough to beat the one-two punch of the opening of Queen's second best album (following Night At the Opera). Sure, both anthems have been overplayed and have become nearly cliches, but We Will Rock You bursts with energy from the opening insistent beats and claps, Mercury's rough vocal and Brian May's astounding solo. I Will Follow - U2 - Boy Not their best album, but still one of their best songs, and that's saying something for a band with such a long and storied career. I Will Follow is quite an intro for the band, as these teens declared themselves to the world, with the Edge's distinctive guitar sound, Mullen's pounding beat, Clayton's pulsing bass and Bono's dramatic vocals. With their first song an album called Boy, these young men had already come of age. Welcome to the Working Week - Elvis Costello - My Aim Is True Another startling entrance for an artist, as Elvis Costello emerges fully formed, in your face and fighting for the blue collar worker, though offering little comfort. With the backing vocals ooh-ing and aah-ing behind Costello's first lines, he kicks it into high gear and doesn't let up as the song clocks in at 1:23. He and the band keep up the pace and quality for the rest, in one of the greatest introductions in rock history. American Music - The Violent Femmes - Why Do Birds Sing? Accompanied by a guitar strumming simple chords, pastor's son Gordon Gano whines to us the question whether we like American music, challenging us to answer in the affirmative as the drummer and band kick it into gear. This semi-punk trio takes us for a ride on this opening song, speeding up in a furious flurry 'til it stops on a dime. The rest of the album is heartbreaking, snarky, joyous, silly, sophomoric, primal, vengeful and literate, leaving one to answer that sure, "I like American music (We like all kinds of music! )", but can't for our lives figure why birds sing. The Blues Walk/Here I Am - Lyle Lovett and His Large Band After the sprightly Blues Walk sets the stage, it then all goes quiet as the spotlight hits on Lyle Lovett who introduces himself, stating simply, "Hello, I'm the guy who sits next to you and reads the newspaper over your shoulder/ Wait - don't turn the page/ I'm not finished/ Life is so uncertain." Here he is indeed. The rest of the song/album is funny, quirky, gender and genre-bending, and contains an array of great bluesy tunes jilted lovers and aching ballads of lovers still together. A personal favorite, Himmelman kicks off his solo career with a rhythmic opening track that gets the heart pumping and a person ready to take on the day/life. It begins simply with a syncopated guitar pattern, but soon builds to a crescendo with grunts & groans, soaring and screamed vocals, drum bursts and echos, and more. It hard not to listen to this without feeling energized and ready to roll. Just One of Those Things - Blossom Dearie - Give Him the Ooh-La-La Opening with a smoldering whisper of a slapping, bouncy upright bass, Blossom Dearie brings a new sound to an old standard. One of the most distinctive voices in pop and jazz history, Ms. Dearie breezes through a tune of rapture and regret in just over two minutes. Accompanied by that bass only for the first minute, the band joins in for the second half, until Blossom and the bass dwindle and fade off. A superb start to her best album, for the Verve label, recorded in 1957. Let the Day Begin - The Call - Let the Day Begin An epic, exuberant, compassionate call to all, a rocker predating U2's Beautiful Day by more than a decade. Michael Been & company lift us up, every one: babies, preachers, dreamers, teachers, doctors, soldiers, the lonely and the homeless in a song that is actually narrated by God, with blessings from above. The Call is one of my favorite bands, and they seem to open every one of their albums in strong fashion. Don't Wake Me - Toby Lightman - Bird On a Wire A rousing opener to one of three of Lightman's great albums. It kicks off with an a capella gospel intro before jumping into a funky/soulful exploration about indecision of a relationship. Toby's incredible pipes hold it all together. I strongly recommend you pick up everything she's done. I Saw Her Standing There - The Beatles - Please Please Me Their first album, which included their two previously released singles and B-sides. But ten more tracks were recorded in a rigorous nearly ten hour session - incredible. Much of the album seems dated now, due to early efforts that weren't their best and some forgettable covers. But it also includes the immortal first-take of Twist & Shout, Love Me Do, Please Please Me & Do You Want to Know A Secret. And the album kicks off with what is still one of the greatest rock tunes ever. What a debut! Another Elvis Costello song & album - had to. Beyond Belief is an evolving, free-form, explosive tune that opens a fantastic album, one of Costello's best. It's one of my all-time favorite songs and one of my favorite album covers ever.